Photo sharing sites have been around for quite some time. If you have a unique value proposition, there is no reason you shouldn’t bring your own photo sharing site online though. 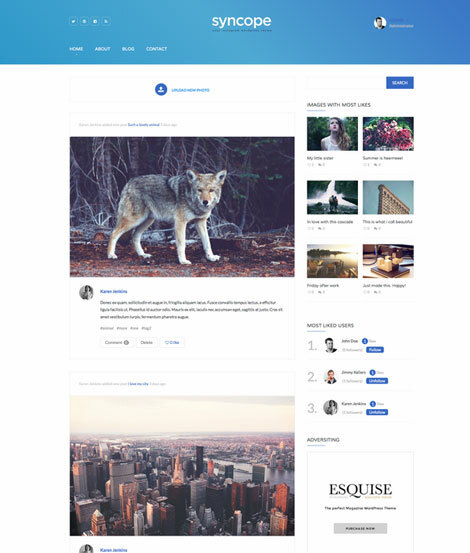 Syncope for WordPress is a BuddyPress compatible theme that lets you build your own Instagram community. This responsive theme is also compatible with WooCommerce. 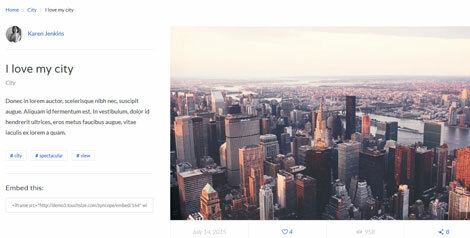 Syncope comes with 20 photo filters, so your visitors can upload their own photos and enhance them on your site. It also has a drag & drop layout builder. The theme is ready for Retina displays. Your visitors can not only view content but also follow others and stay in touch via messages. Syncope comes integrated with Google fonts and unlimited headers/footers. It has social widgets, 4 built-in sliders, and localization support. This is a commercial theme by an Elite Author.